A trademarks allows its owner exclusive rights to associate a particular word, phrase or visual symbol with her products. A trademark can cover things like a brand name, a slogan or a logo. You don't have to register a trademark to use it, but registration is a useful way to prove the trademark belongs to you. In the United States, the Patent and Trademark Office, part of the Department of Commerce, handles trademark registration. Through USPTO, you can trademark a word or phrase. Make sure no one else has registered the trademark you want for a similar brand or product. Visit http://www.uspto.gov/trademarks/index.jsp and click on “Trademark Electronic Search System (TESS).” Follow the directions to conduct a search for your word or phrase and others that are similar. It's OK if someone has registered the same or a similar phrase as long as it's for a different kind of product or service. Decide whether you would like to use plain text or a stylized logo in your trademark registration. If you want to use a logo, get it ready before starting the application. If you are already using your trademarked word or phrase, get a document in which it appears. This will be your evidence of use. Write a description of the product or service associated with your trademark. Visit http://tess2.uspto.gov/netahtml/tidm.html to search for examples similar to your product. Visit http://www.uspto.gov/teas/starting.htm and file an application to register your trademark. Look through the preview to identify any other information you will need to collect before you start. USPTO will charge a non-refundable filing fee. TEAS will assign your application a serial number; record it for future use. Check on the status of your registration by vising http://tarr.uspto.gov/ and searching for your serial number. USPTO says you should receive a response within five to six months. You can't trademark ideas. If you want to protect an invention, you need to get a patent. For a piece of writing, music or other art, you need a copyright. Speak with a trademark attorney if you have any questions about getting a trademark. 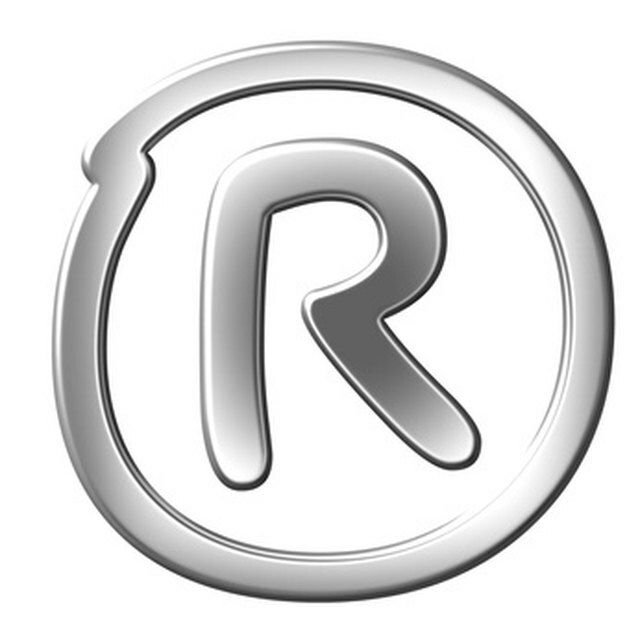 Don't use the federal registration symbol ® until the USPTO officially registers your trademark. A U.S. trademark is not valid outside the United States. If you want your trademark to apply in other countries, consider filing an application with the Madrid Protocol. United States Patent and Trademark Office: Where do I Start? Elliot Quimby has been a freelance writer, editor and proofreader since 2008. Quimby has written, edited and proofread grant proposals, press releases, cover letters, resumes and website content. Quimby earned a Bachelor of Arts in creative writing and literature as well as linguistics at the University of Michigan. Quimby has contributed to a blog on Urbanministry.org.